Find your own personal paradise on Mexico's pristine beaches. 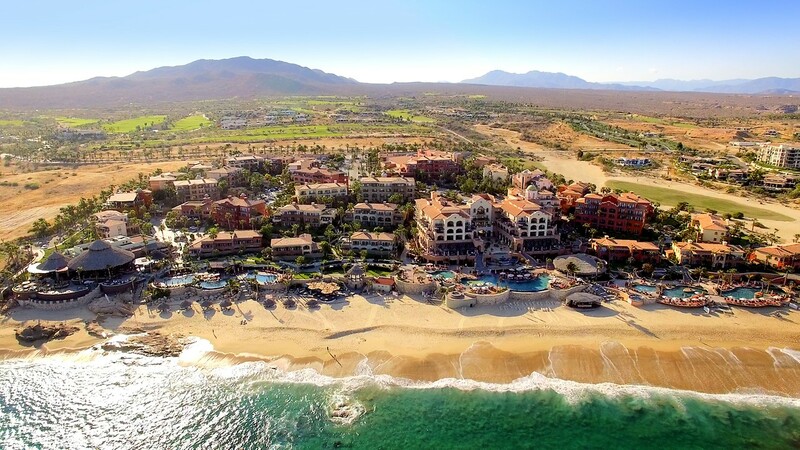 Hacienda del Mar Los Cabos effortlessly blends Old World charm, modern style, and unmatched service. The moment you enter our resort here in the exclusive Cabo del Sol development, you’ll know you’ve arrived somewhere special. Beautifully landscaped gardens with tropical vegetation and glistening pools provide a true desert oasis. Resort architecture is constructed in the distinctive hacienda style, with rustic red tile roofs – giving the impression of a traditional Mexican village. Make yourself at home in one of our inviting suites, which feature kitchens and Jacuzzis; many offer beautiful sea views. Relax in our Cactus Spa, play golf at one of the top-notch courses next door, or enjoy a range of family-friendly activities, both here and in the surrounding area. Dine on award-winning cuisine at one of our on-site restaurants, and let our friendly staff help make your visit unforgettable. We can't wait for you to join us! Package available for travel dates between January 18th., 2019 and January 10th., 2020. Package Includes: Daily Full Breakfast for all guests paying package rate | Welcome Signature Drink upon arrival for guests paying package rate | Premium WiFi | Complimentary Parking | Minors from ages between 6 – 12 years old pay 50% from restaurant’s kids menu accompanied by adult. Kids 5 years old and younger eat free from restaurant’s kid’s menu. Package Includes: Every 4th Night Free | Daily Full Breakfast for all guests paying package rate | Welcome Signature Drink upon arrival for all guests paying package rate | Premium WiFi | Complimentary Parking | Minors from ages between 6 and 12 years old pay 50% from restaurants kids menu accompanied by adult. | Kids 5 years old and younger have free breakfast from restaurants kid’s menu accompanied by adult. Package Includes: Daily Full Breakfast for two at Girasoles Restaurant (available also through Room Service) | Welcome Signature Drink upon arrival for two | Strawberries with chocolate delivered to room on arrival night | Bottle of House Sparkling Wine delivered to room on arrival night | One 3 Course Romantic Dinner for Two at our Asian Fision Fine Dining Pitahayas Restaurant | One Bottle of House Red or White Wine to be served with Dinner | Premium WiFi | 4pm Late Check Out | Complimentary Parking. Package includes: Daily Full Breakfast for all guests paying package rate at Girasoles Restaurant | Up to 2 Kids under 12 years old eat free from Kids Menu | Welcome amenity for 2 kids (2 chocolates, 2 large bags of chips, 4 assorted soft drinks, 2 individual packets of popcorn) to be delivered to room on arrival night | One Tacos Welcome Lunch per stay at Tortugas Beach Restaurant for adults paying package and 2 kids under 12 years old. Includes two non-alcohol beverages per person. | Additional minors from ages between 6 and 12 years old pay 50% from restaurants kids menu accompanied by adult. | Kids 5 years old and younger have free breakfast from restaurants kid’s menu accompanied by adult. | Premium WiFi |Complimentary Parking. Package Includes: Daily Full Breakfast for all guests paying package rate | Welcome Signature Drink upon arrival for all guests paying package rate | Daily Car Rental Premium SUV | Premium WiFi | Complimentary Parking | Minors from ages between 6 and 12 years old pay 50% from restaurants kids menu accompanied by adult. Kids 5 years old and younger have free breakfast from restaurants kid’s menu accompanied by adult. Package Includes: Daily Full Breakfast for all guests paying package rate | Welcome Signature Drink upon arrival for all guests paying package rate | Daily Car Rental MidSize SUV | Premium WiFi | Complimentary Parking | Minors from ages between 6 and 12 years old pay 50% from restaurants kids menu accompanied by adult. |Kids 5 years old and younger have free breakfast from restaurants kid’s menu accompanied by adult. Package Includes: Daily Full Breakfast for all guests paying package rate | Welcome Signature Drink upon arrival for all guests paying package rate | Daily Car Rental Standard Size | Premium WiFi | Complimentary Parking | Minors from ages between 6 and 12 years old pay 50% from restaurants kids menu accompanied by adult. | Kids 5 years old and younger have free breakfast from restaurants kid’s menu accompanied by adult. This is the place to relax! 5th time and always amazing! Unbelievable value for gorgeous oceanfront property! I loved Hacienda Del Mar!!! A great experience, I enjoyed a lot! We love our Hacienda timeshare! The best place in Cabo! Excellent family vacation once again! Still one of the top places in Cabo. Our favorite RCI place to stay! We are always greeted with warmth from entire staff. One of the nicest resorts we have ever been too!! My favorite vacation every year! Thank you Hacienda del Mar!! !